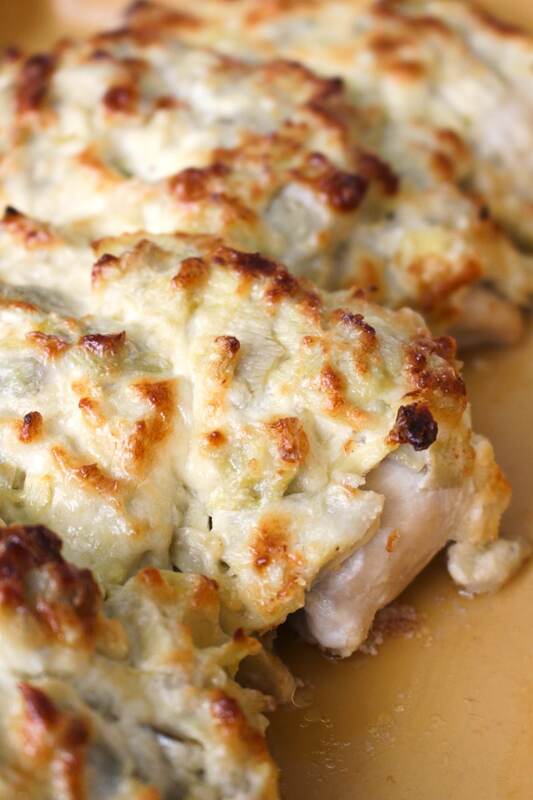 This Artichoke Chicken Bake features juicy baked chicken smothered in a creamy parmesan and artichoke topping. 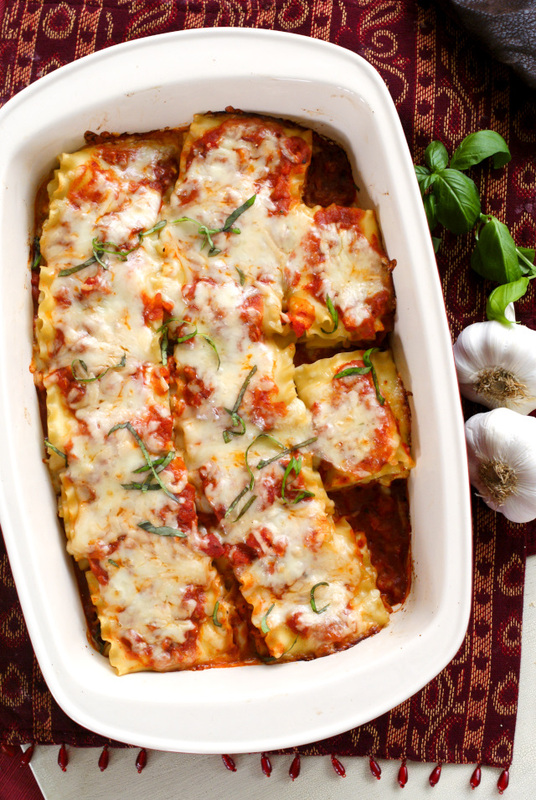 It is an easy dinner recipe that you will want to make again and again! Oh, my friends. 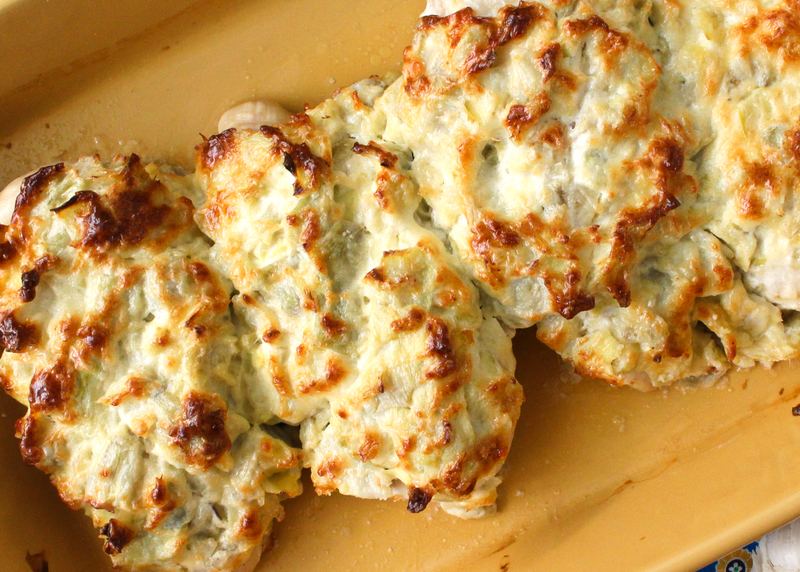 Let me tell you about this delicious artichoke chicken that you need in your life. First of all, this recipe is so darn easy to prepare. Second of all, you most likely already have everything you need to throw it together. Basically, if you like artichokes and you like chicken, there’s really no reason not to try it. I assure you, you will not be disappointed! 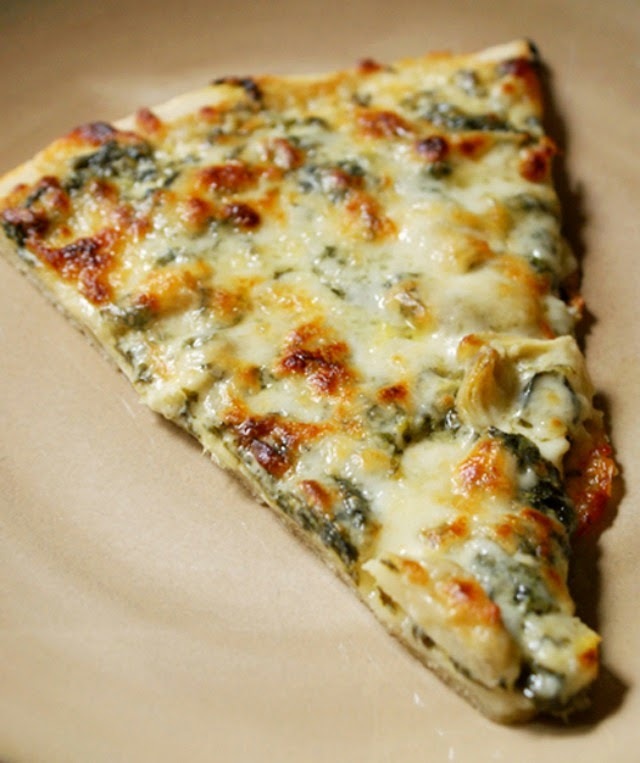 I’m sure when you think of artichokes, the first thing that comes to your mind is spinach artichoke dip. I don’t blame you. Spinach artichoke dip is like the king of all creamy, cheesy dips out there. However, I am here to tell you that artichokes are for so much more than just dips! 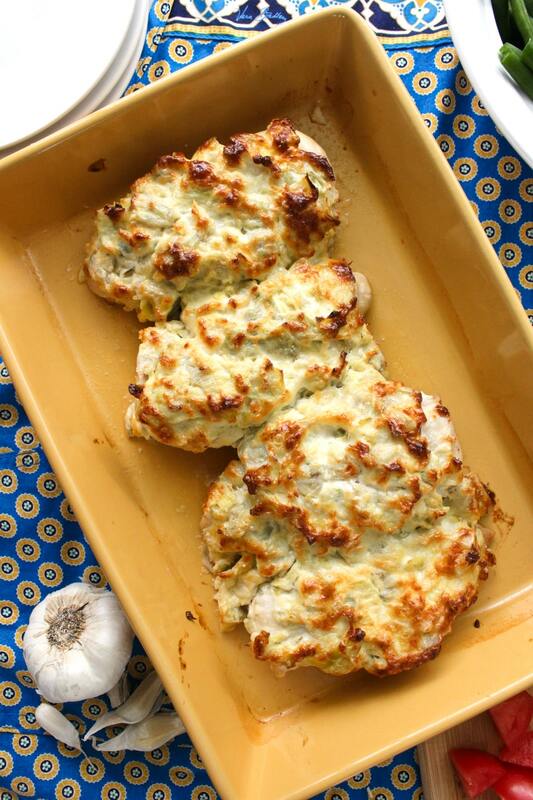 Artichokes are front and center in this easy recipe and they really shine in the cheesy topping that’s baked on top of the chicken. 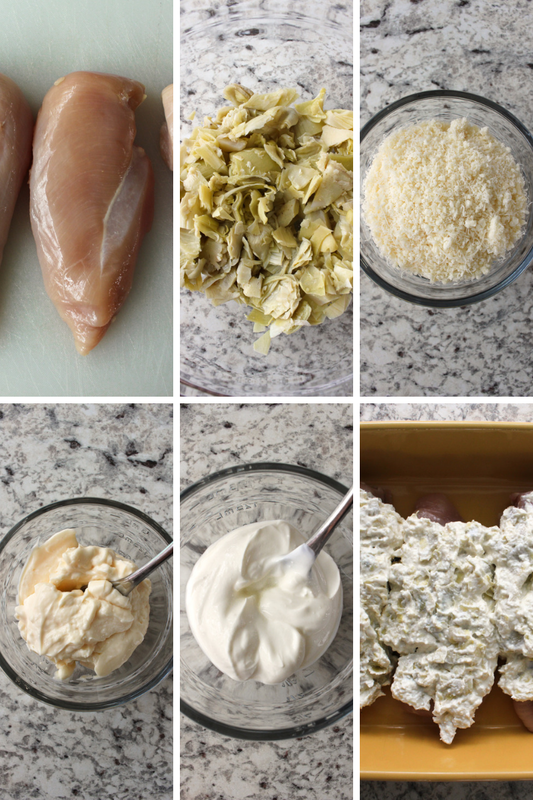 Think creamy, bubbly, cheesy artichoke dip slathered over chicken. Sounds good, right? It so is. Not only does it taste great, but, like I said before, it takes a quick five minutes or so to prep and you can’t beat that! I am always looking for new ways to prepare chicken that’s not simply baked or grilled. I’m not knocking a simple baked or grilled chicken recipe, but sometimes I want to jazz things up a bit on chicken night. 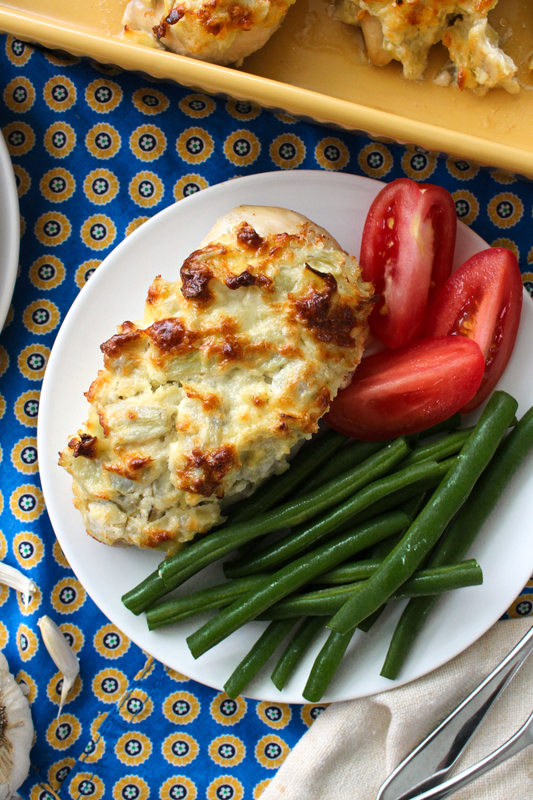 The same old chicken all the time can get boring and this recipe is anything but boring! 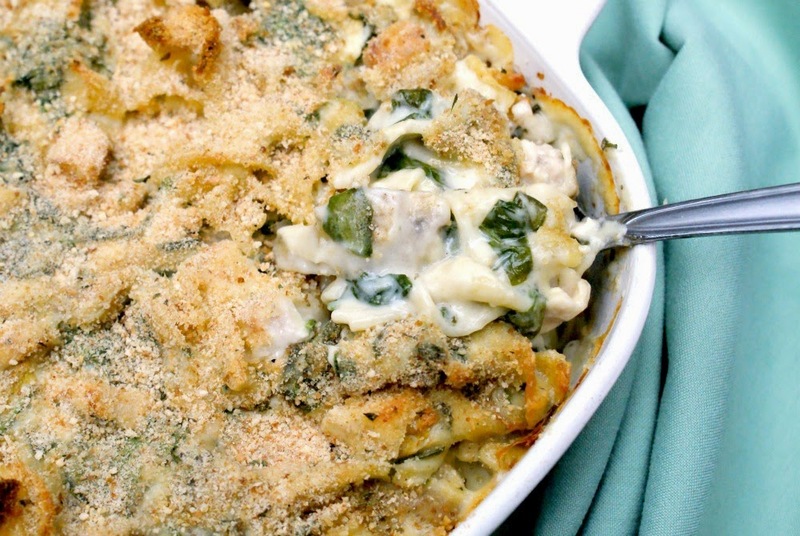 This Artichoke Chicken Bake is made by topping boneless, skinless chicken breasts with a mixture of canned artichokes, grated parmesan cheese, mayonnaise, sour cream, and fresh garlic. It is baked in the oven until the chicken is cooked through and the topping is golden and bubbly. WHAT KIND OF ARTICHOKES SHOULD I USE? When buying artichokes, there are several options: fresh, frozen, marinated, or canned. Fresh takes quite a bit of time and effort to prepare so I would not use them for this recipe. Thawed frozen artichokes would work, but can cost more than canned or marinated. Marinated artichokes would also work, but, along with the extra flavors from the marinating liquid, they may be a bit oily due to the packing liquid. I suggest using canned artichokes that are rinsed and patted dry with a paper towel for best results. Both whole and quartered artichoke hearts will work because they are chopped after draining, rinsing, and drying. 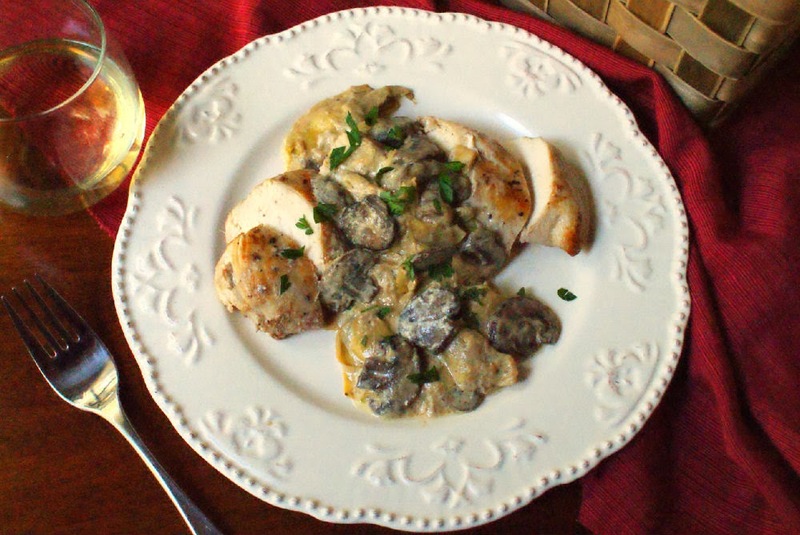 WHAT KIND OF CHICKEN IS BEST FOR ARTICHOKE CHICKEN? 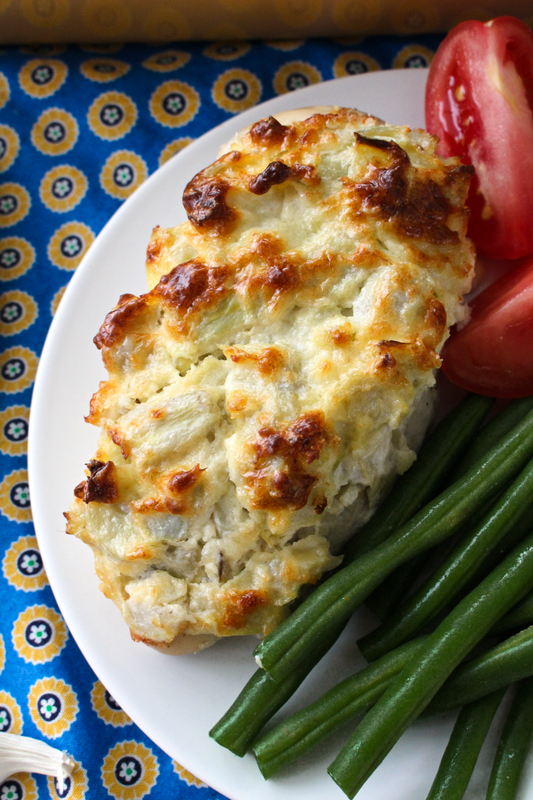 This Artichoke Chicken Bake is topped with a hearty portion of artichoke topping. Chicken thighs would be too small to support the topping, so I suggest sticking with chicken breasts. Boneless breasts are recommended. The topping is rich and creamy, so I suggest serving this with a steamed vegetable and a side salad for a balanced meal. A side of wild rice or pasta would also go well with this dish. 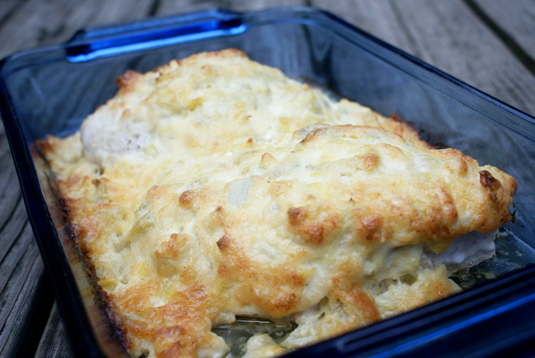 This Artichoke Chicken Bake features juicy baked chicken smothered in a creamy parmesan and artichoke topping. 2. Season the chicken breasts with salt and pepper and place into a large baking dish. 3. Drain the artichokes and rinse with water. Dry all excess moisture from the artichokes with a paper towel. Chop the artichokes into small pieces. 4. In a medium bowl, combine the chopped artichokes, parmesan cheese, mayo, sour cream, and garlic. Spread the mixture evenly over the chicken breasts. 5. Bake uncovered for 35-45 minutes or until the internal temperature reaches 165 degrees F.
Made this tonight. Simple and delicious. Didn't even have to make a trip to the grocery store. Wonderful! So glad you enjoyed it.